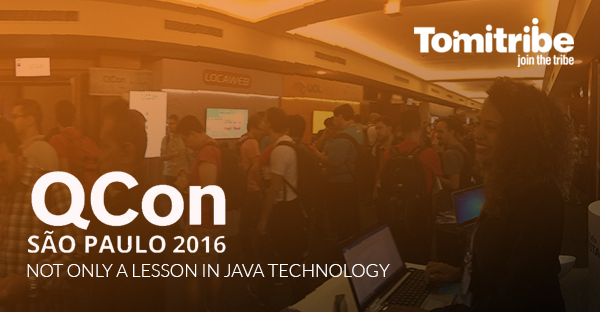 Aligned with the proud growth of the Brazilian Tech Community was QCon 2016 in Sao Paulo. 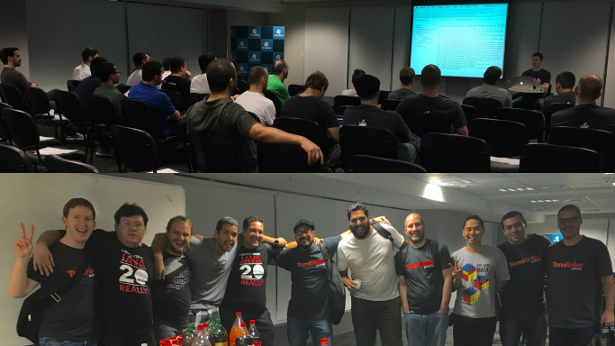 Many software professionals worldwide, and Tribers from Tomitribe including Amelia Eiras, Daniel Cunha, David Blevins and Thiago Veronezi, came to attend this practitioner-driven conference to gain heaps of knowledge and share their support for a strong developer community. QCon is not just a Java conference. The Brazilian Tech Community warmly welcomes Conference attendees from all over the world and technologies. QCon-SP had a good selection on a variety of topics; these sessions were directed towards managers, designers, operations and developers. We had the opportunity to meet and talk with some of its attendees, presenters and also developers outside QCon, it was a fun week. Upon arrival, Fabiane Nardon, invited international travelers like us to a delicious welcome typical Brazilian dinner. Thank you Fabiane & everyone for a great time. Otávio Santana awareness of key events happening in the Sao Paolo Tech Community gave us the opportunity to attend @devbeers monthly gathering. Thank you Octavio and DevBeers Community for a great night filled with good laughs. 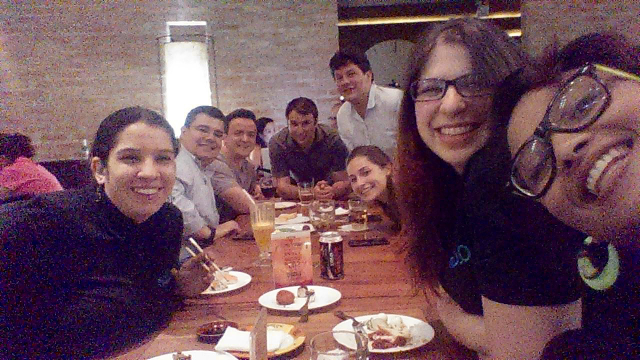 In addition to QCon, Tomitribe joined the SAO Meetup group lead by Otavio Santana and members. Approximately 40 members attended the presentation on “Apache TomEE, from Dev to Ops” by David Blevins and rounded out the evening fun and festivity with food and tropical drinks. by Rodrigo Cândido Interesting presentation about self-healing microservices. Rodrigo Cândido gave us some nice examples of distributed applications that stay up even in the event of failure in some of its nodes. He presented Spring Cloud Config and Netflix OSS as solution along with directions on integration with Java EE. Great introduction to Netflix OSS with a neat demonstration. by Eder Ignatowicz Java 8 is here, but this does not necessarily mean we already use it properly. Eder Ignatowicz showed us how to transform a legacy and common real-world java implementation into a better readable and more manageable Java 8 code. It’s nice to see how expressive Java 8 can be. He relates design patterns, real-world applications and Java 8.
by David Blevins If you are not yet convinced of the extensibility of Java EE, please check out this presentation from David Blevins if you have a chance. There is no need to wait for the next big Java EE release to get hold of that sweet new feature. CDI makes the EE platform very adaptable; you can implement that functionality yourself right now. He also shows some nice opportunities for the next Java EE 8 release with the use of Java SE 8 functional capabilities. by Fabiano Santos In this talk Fabiano Santos shared the experience to build an architecture that uses Kafka as a data source for integrated messaging with Spark Streaming. With emphasis on having an architecture with 24/7 availability without loss of messages and ensuring that each message is processed only once. It shows each difficulty encountered and the results obtained from the use of this architecture in a complex and real situation. by Ben Coverston Through Cassandra’s evolution peculiar anatomy has developed. Ben Coverston described those anatomical pieces and how they function as a reaction to the environment in which Cassandra evolved. He showed somewhat deeply technical problems that a distributed database as Cassandra faces, and how, technically these problems have been resolved. Addressing issues such as replication, Log Structured Storage, Data Versioning, Consistent Hashing and more. by Paulo Silveira if you don’t know how to manage your product, then you need to see this talk. Paulo Silveira showed a vision of a programmer to other programmers, with all his experience based in two of its major success stories, the GUJ (www.guj.com.br) and Alura (www.alura.com.br). He explored the importance of the product manager, speaking of it real role and how to define strategies to deal with such metrics as the basis to calculate the WU, Cohort and Churn. 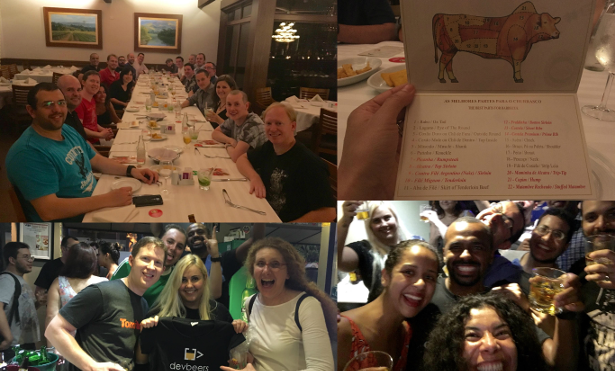 QCon São Paulo 2016’s presentations alone are great yet having the opportunity to reunite with old friends and make tons of new ones is what makes attending to Tech Conferences extraordinary. Special thanks to Leonardo Galvao and the QCon Team for bringing together such a rich experience.